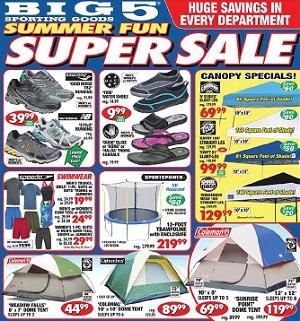 This week Big 5 Sporting Goods weekly ad circulars, deals and sale specials. Save with the Big 5 store ad featuring the best savings & promotions on sporting goods equipment, apparel and footwear. Weekly Deals: Columbus Colonial 10′ x 10′ Tent; Saucony Grid Ridge TR2 Running Shoes; Maui & Sons Tide Water Shoes; Body Glove Kona Sandals; Bearpaw Lassen WP Hiking Boots; Kent Shockwave Mountain Bike; World Famous Sports Big 5 Armchair; Intex Full-Size Classic Downy Airbed; Under Armour Crusher Men’s Football Cleats; Nike HyperVenom Phelon FG Youth’s Soccer Cleats; Wilson BLX Two Tennis Racket; Wilson K-28 15-Piece Golf Package; Spalding NBA Zi/O Excel Basketball; Roller Derby Pro Line 900 Inline Skates; Coleman Kern River Sleeping Bag; Coleman 50-Quart Wheeled Cooler; Ecogear Waterdog Hydration Pack; CASIO G-Shock Sport Watch; Nike Graphic Stripe Tee; adidas Essential Shorts; Under Armour Short-Sleeve Tech Tee; Nike Flex Show TR 2 Training Shoes; FILA Trenti Running Shoes; HI-TEC Ultimate Hiking Boots; Under Armour Playmaker Unisex Slide Sandals; and much more. Big 5 stores activate their latest weekly ad every Sunday. Big 5 Sporting Goods is one of America’s top retailers of name brand sporting goods and accessories. The retailer has 426 locations spread throughout 12 western states. The stores averages approximately 11,000 square feet, selling athletic shoes, apparel and accessories, as well as a broad selection of outdoor and athletic equipment for team sports, fitness, camping, fishing, tennis, golf, snowboarding and in-line skating.